After a few years of battle royal with its rival port to the south, Vancouver stands to gain 20% more cruise business this year, while Seattle stands to lose 10%. Today, we look at some of the differences between the two ports, both of which are important to the Alaska cruise trade. Meanwhile, for the first time in decades, San Francisco has a year-round ship, with the 2,600-berth Grand Princess based there since last month. And the Gulf of St Lawrence has received its first purpose-built passenger ship in seventy-five years. 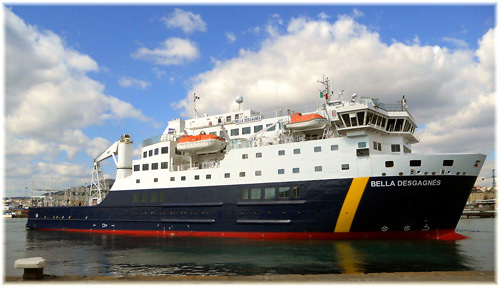 The new Bella Desgagnés will operate weekly coastal and cruise service from Rimouski, Quebec, to Blanc Sablon, at the Strait of Belle Isle. Condé Nast Traveler and The Economist’s Global Livability Survey both rank Vancouver as one of the most beautiful and livable cities in the world. Surrounded by snow-topped mountains, green forests and blue seas, it also counts as one of the world’s most attractive cities. Sitting on the west coast, protected from the stormy Pacific by the huge landmass of Vancouver Island, it has always been a key setting off point for cruises to Alaska. 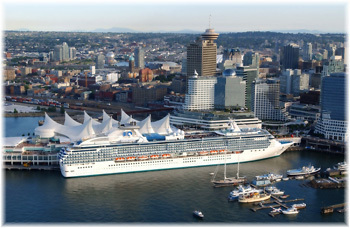 For the 2013 cruise season about to start, Vancouver anticipates a more than 20% increase in business, with more than 820,000 passengers passing through the port’s two cruise terminals on fourteen different lines. Included in these will be four new ships to be based in Vancouver this year: the 1,750-berth Disney Wonder, Holland America’s 1,380-berth Amsterdam, the 1,936-berth Norwegian Sun and Oceania’s 684-berth Regatta. Last year, Vancouver welcomed 667,000 passengers on twenty-eight different vessels making 191 calls. During the 2012 cruise season, sixty vessels connected to the port’s shore power facilities, reducing greenhouse gas emissions by 2,266 tons. Vancouver’s first cruise of the 2013 season leaves this Thursday, with Holland America’s 1,440-berth Zaandam departing on an early 17-night Circle Hawaii cruise calling at Honolulu, Lahaina, Hilo and Nawiliwili before sailing back to Vancouver by way of Victoria. She will then start her Alaska season on May 5. Meanwhile, the 2,124-berth Carnival Miracle opens the Alaska season on April 29, with an 8-night Alaska cruise that will terminate at Seattle, where she will be based for the summer. On the same day, Crystal Cruises’ 960-berth Crystal Symphony will be setting off on a 7-night coastal cruise from Vancouver to Los Angeles via Victoria, Seattle, Astoria and Santa Barbara. Seattle’s first Alaska departure will be a May 7 sailing by the Carnival Miracle, following directly on her April 29 cruise from Vancouver. The US port is expecting a 10% drop in passenger numbers this year, from 934,900 on 202 ships in 2012 to 851,900 on 188 ships in 2013. This will mean similar passenger numbers for both Vancouver and Seattle this year, whereas last year Seattle handled 40% more passengers than Vancouver. It will also be Seattle’s lowest passenger volume in half a dozen years, since 2007. Vancouver still maintains the advantage of being an international port, so that cruise lines can offer both round trip and one-way cruises to and from all US ports, whether on the mainland, Hawaii or Alaska. Meanwhile, one-way cruises can only be offered between Seattle and Los Angeles or Seattle and Alaska in cases where the ship is US-registered. Cruise lines basing ships in both Vancouver and Seattle this year include Carnival, Celebrity, Holland America, Norwegian, Oceania, Princess and Royal Caribbean, while Vancouver will also host ships from Crystal, Disney, Hapag-Lloyd, Noble Caledonia, Phoenix, Regent and Silversea. After almost a decade of battle with Seattle, followed more recently by the Alaska head tax, which put a damper over the whole trade when ships left for other waters, the two ports seem to be settling down to some sort of pattern. But, whatever may be said about the new cruise terminals in Seattle, Vancouver still has two great advantages. First it is 125 miles closer to Alaska, which is 250 miles extra steaming time from and to Seattle on a round trip, or a whole extra day if slow steaming. And second, as mentioned above, Vancouver’s location in Canada allows one-way voyages to be legally made to or from any port in the United States, including Alaska, Hawaii and ports further south in California. 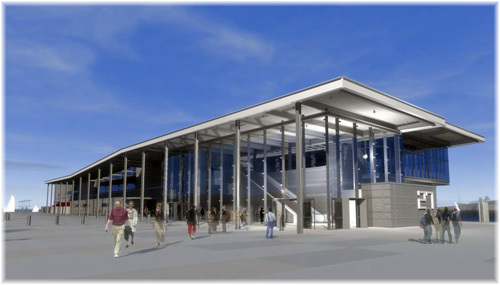 Although Seattle is possessed of a great airport in Seattle-Tacoma International with lots of US flights, Vancouver too has a terrific airport, and these other advantages are probably finally settling in to the minds of cruise lines operating to Alaska, well before we even start to talk about the relative merits of the two cities as destinations in their own right. For many decades, San Francisco was known as the headquarters of the famed Matson Lines, whose fabled 26,000-ton passenger liners Lurline and Matsonia maintained regular passenger service to and from Hawaii until the early 1960s, and whose container ships carry on in that trade today. In more recent years, between 1972 and 1994, San Francisco served as headquarters of the famed Royal Viking Line, which had its headquarters in the Embarcadero Center, and was finally absorbed by Cunard Line. 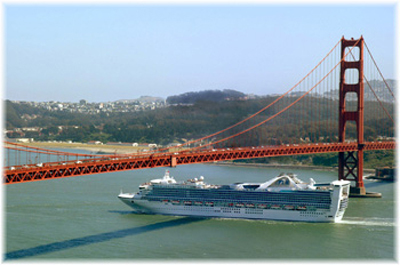 Last month, San Francisco was back in the news as a cruise centre, when Princess Cruises started year-round cruises from San Francisco with its 2,600-berth Grand Princess. This ship will be the first for decades to be based year-round at San Francisco. While several ships have homeported in San Francisco for round-trip Alaska cruises since 1969, it has only been during the summer season. Grand Princess will offer thirteen voyages to Alaska, two to Mexico and fifteen sailings to Hawaii, as well as a number of coastal cruises to California ports that will turn at Ensenada. Until now, San Francisco has hosted sixty to eighty cruise ship calls per year, handling about 200,000 passengers, with itineraries including round trips to Alaska and Mexico, as well as positioning voyages in the spring and autumn that begin or end in San Francisco. With the Grand Princess, however, the port will gain substantially, with another 37 cruises over the next fifteen months, accommodating 95,000 passengers. The Grand Princess departed on the first of her year-round cruises when she left San Francisco’s Pier 35 at 10 pm on March 16, heading out under the Golden Gate Bridge on the old Matson route to Hawaii. The Grand Princess has since undertaken two more departures from San Francisco, on March 31 for Mexico and on April 10 for Hawaii. These inaugural San Francisco cruises have been a sell-out and when she leaves San Francisco for Hawaii again on April 25, she will once again be full. Meanwhile, the Grand Princess’s Alaska season begins on May 10, with the first of thirteen 10-night Inside Passage cruises, round trip from San Francisco. Each call at San Francisco should be worth about $1 million for the local port economy. Quebec-based Groupe Desgagnés and its subsidiary Relais Nordik last week announced the arrival of the new coastal passenger and cargo ship Bella Desgagnés to the Gulf of St Lawrence. Built in Croatia and completed in Italy, the new ship made her Canadian landfall at Halifax on Tuesday April 9, and arrived at Blanc-Sablon on Thursday April 11. 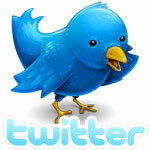 The ship’s arrival in Canada was delayed about four days because of fierce Atlantic storms. The new ship was built to serve the route from Rimouski, on the south shore of the Gulf of St Lawrence, via Sept Iles and Anticosti, to a range of ports on the Lower North Shore as far downstream as Blanc Sablon, which is located at the Quebec/Labrador border on the Strait of Belle Isle. From Blanc Sablon, there is regular ferry service across the Strait of Belle Isle to St Barbe, Newfoundland. At 312 feet in length, 63½ feet beam and only 14½ feet draft, the Bella Desgagnés can accommodate 381, including deck passengers. The new ship has 63 cabins (126 berths), some of which are de luxe, dining room, cafeteria, lecture room and other passenger facilities. Measuring 6,588 gross tons, she has been built to replace the much smaller 1,749-ton Nordik Express, which has been on the route since 1987. The Bella Desgagnés is built to Ice Class IA and can reach a speed of 15 knots. Her propulsion system consists of four diesel engines driving two electric motors and two azimuthing stern drives. She also has two bow thrusters and has manoeuverability similar to a large harbour tug. Other than ferries, the Bella Desgagnés is the first ship to be purpose-built for the Gulf of St Lawrence trades in seventy five years. The last was completed in 1938, when Davie Shipbuilding of Lauzon delivered the 888-ton North Gaspé to the Clarke steamship Company. This ship served the Magdalen Islands, at first from Montreal and Quebec and from 1961 from Nova Scotia and Prince Edward Island. She finally became a cruise ship in the Galapagos islands in 1973. Somewhat like a small version of Norway’s Hurtigruten ships, the Bella Desgagnés has been designed to carry passengers, general cargo and vehicles from the main terminals of Rimouski, Sept-Îles, Havre-Saint-Pierre and Natashquan to eight ports at Port-Menier, Kegaska, La Romaine, Harrington Harbour, Tête-à-la-Baleine, La Tabatière, Saint Augustin and Blanc Sablon. Cruises of 7 nights duration will be offered from Rimouski. Present fares for the Nordik Express start at $1,258.40 per person in a superior cabin, or $1,494.86 in a de luxe cabin. Fares for the Bella Desgagnés will be announced shortly. Summer cruises will leave Rimouski every Tuesday at 12:30 pm and turn at Blanc Sablon on Fridays.